Amazon has issued the first major firmware update for the Kindle Voyage, new $79 Kindle Basic Touch and the Paperwhite 2 today. A number of notable features are now available, such as the ability to share all of your purchases with family members, making it easy to accumulate a vast library of content. Word Wise—For readers learning English and children learning to read, Word Wise makes it easier to understand more challenging books more quickly. Short and simple definitions automatically appear above difficult words, so you can keep reading without having to stop and look up a word. To see the various meanings the same word can have in different contexts, just tap on the word to quickly bring up a card with definitions, synonyms, and more. You can adjust the number of definitions you see with a slider, dialing them up or down as you learn and grow your vocabulary. Word Wise is already available on thousands of titles, including The Hunger Games, The Giver, and Wonder. 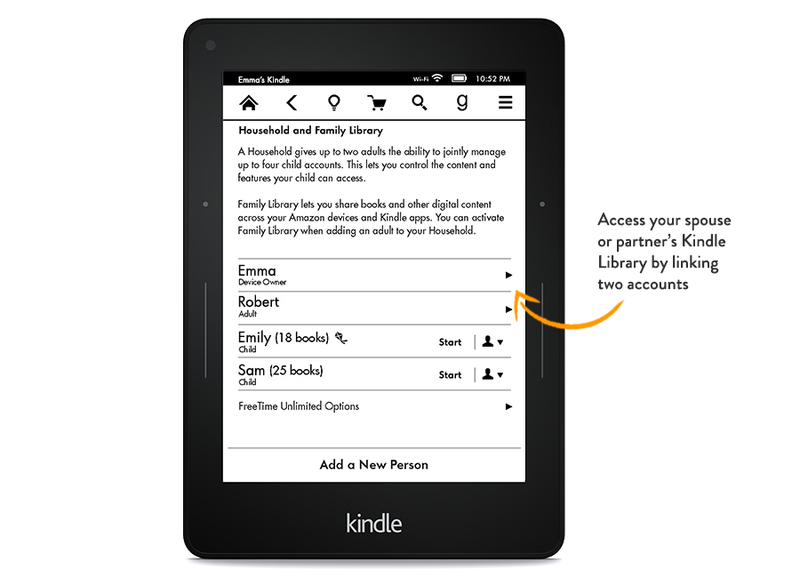 Family Library—For the first time, you can access not only your own Kindle books, but also books from the Amazon account of a spouse or partner. Expanded X-Ray for Books—X-Ray now makes it easier to explore as you read—quickly flip through all the images in a book, and use the new timeline view to easily browse the most notable passages. Deeper Goodreads Integration—Goodreads on Kindle now allows you to easily share your reading progress updates, add books from your Kindle library to your Goodreads shelves, and see your friends’ updates, ratings and reviews when looking at a book on Goodreads. Enhanced Search—Makes it even easier to find what you are looking for by combining and previewing results from your Library, Goodreads and the Kindle Store on the same page. About This Book—See information about the book as you start to read, including its place in a series and author information, plus mark it as “Currently Reading” on Goodreads. Amazon tends to release firmware updates slowly. So you likely won’t get it right away. Alternatively, you can manually download and install the update by visiting www.amazon.com/kindlesoftwareupdates and copy the file to the root of your device by plugging your Kindle into your PC using the USB cable. Once you do this and click the update button in the settings menu your Kindle will self-update.